When looking for a front loader washing machine brand that is highly efficient and is packed with powerful features, the Bosch WFVC5400UC is worth checking out. With WFVC5400UC's variety of features. dealing with different laundry loads and types of fabric is a breeze. The unit uses EcoSmart Technology for smarter sensors and a more efficient washing process. The ActiveWater feature can turn 13 gallons of water into 400 gallons of washing power. EcoAction feature lessens your energy usage. Users can choose from 15 different washing cycles. When washing bulky and heavy fabric such as comforters, simply activate the Comforter Cycle for a more thorough cleaning. If you have only 20 minutes to wash a light load, use the machine's Quick Light 20 cycle. When washing your favorite jeans, use the unit's Jeans cycle which can effectively clean denim items while protecting the fabric from elements that can lead to shrinking and fading. A smoother and more silent operation is possible with the WFVC5400UC's AVS Anti-Vibration system. With its Energy Star rating, this washing machine can help you save energy and money in the long run. Because this machine is from Bosch, it uses EcoSmart technology for its sensors. For a more efficient washing and drying process, the unit has a maximum spin speed of 1150 rpm. The machine's 15 wash cycles offer you flexibility when washing various load and fabric types. These cycles include Comforter, Jeans, Quick Full, Quick Light 20, BabyCare, Delicate, Drain/Spin, and Wool/ Handwash. You can also take advantage of the machine's Stain Removal option when dealing with hard-to-remove stains. If you're some sort of neat freak, you'll definitely appreciate the washing machine's XxtraSAntiary feature which can heat up washing water up to 170 F.
Getting rid of harmful bacteria commonly found on laundry items is also easier with the unit's NSF certification. If you want a more peaceful laundry time, this machine uses an AVS Anti-Vibration system. Plus, this product also comes with a two-year warranty and is backed by a Good Housekeeping seal. For proven durability, the tub is made of stainless steel. The Bosch WFVC5400UC is packed with a lot of useful features but the price is expensive. Plus, some consumers have reported that the washer instructions or manual is missing from the package when delivered. The front panel on washer rusted and it was within the warranty period but bosch would not replace it. Now the machine won't spin and there are no service techs where I live. The 800 number folks can't help. Totally unacceptable! Expensive, won't spin and drain a bath mat , delicates temp has ruined cashmere and wool sweaters, lights stay on when done, if you pause and turn back on starts all over! Now at the ripe age of three it is leaking from the soap tray and peeling the paint! Also stuck with the matching dryer which takes two hours to dry sheets cuz it rolls them into a tube! Overall this seems like a pretty good washer, but ours stopped draining properly, less than a month after the 1-yr warranty expired. It goes thru all the cycles except the final hi-speed spin. It has a drain/spin cycle, but most of the time it doesn't work either. I'm talking about water-dripping-off-the-clothes wet at the end of the cycle. This also makes it smell old and musty. We purchased this washer at the end of 2010. Other than a drum-weight nut and bolt needing a bit of Loctite to prevent the nut loosening, the washer has been fabulous. Our clothes are very clean with less energy and water. It holds a large load and the door is big. The spin speed is surprising at first, but it is very effective. My washer is on concrete and is perfectly level. It has not moved from its spot. Noise levels are not bad. I live in Florida near the coast, and I have had no mold or odor problems. Simply wipe the door seal gasket all the way around (don't forget under the folded area of the gasket) and leave the door open an and inch or two. Do not put anything between the door and gasket to keep it open, it will deform the gasket over time and you will get leaks. My washer is in the garage and is not in the a/c. The Service tech suggested we run a gallon of white vinegar through every 6 months or so. Mold can be prevented with a bit of effort. As far as detergent, the service tech said no more than 2 table spoons for normal loads and 3 for very soiled loads. I use HE Arm and Hammer and have excellent results. Out of all the front load washers after doing much research, I decided to go with the Bosch 500 series. Purchased it over 2 yrs ago and it seems to be still in good condition. I was under the impression that you could do an extra large bath size towel load about 10 towels but according to the technician you can wash maybe 5- 6 of them for it to spin and balance correctly.. these machines can hold about 20 pounds of wet laundry so don't be fooled but the tub size. Excellent tumbling action which is gentle on your clothes.. As for the comforter cycle you can wash up to a queen size one.. at least that will fit ..King size comforters are too big.. which was the only disapointment. It does use minimal water and gets the clothes cleaner than any top loader.. I am extremely pleased with this washer. Have now had it for a few months and used every cycle many times. its very quite and really cleans. Even the quality of the hose attachments is far better than the standard hookup hoses. (My last washer was a Kenmore that lasted less then a year before it self destructed and left tranmission oil all over the tile floor.) I purchased the BOSCH dryer at the same time and it dries clothes quickly. I plan on buying the Bosch dishwasher next. I am interested in the purchase of The Bosch Washer WFVC5400UC but have no confidence in the reviews I am reading on the web pages. Any employee from Bosch can easily type in a good report on a certain model and likewise another Company employee can give the BOSCH a bad rating. I am confused about some of the BOSCH reviews on their washers and dryers. Any person can get on here and give a good or bad ratings: Some will raise your hair. How are we as customers to know what is TRUE or FALSE? I would like to buy BOSCH because I am told the Washing machine and dryers are built in the USA. We decided to purchase this washer because Bosch had a good reputation for quality and we own other Bosch products. In the showroom it looked good with all the chrome and felt solid. However this washer had problems from the start. When in warm wash mode water leaked out of the detergent drawer. Service personnel made adjustments on plastic in the drawer and leak stopped but only when no detergent was placed in drawer. Four months later a leak developed at the bottom right of the washer. Also the door would not unlock at the end of the wash cycle. Service personnel were called again and ordered replacement parts for the detergent drawer, mechanical lock and drain pump, all this in less than six months use with a family of three. If you are considering purchasing this model, I suggest you add the extended warranty to the overall price. 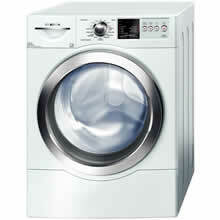 We purchased the BOSCH WFVC5400UC washer and matching dryer WTVC6330US about 6 weeks ago. We are absolutely thrilled with the products. I was hesitant to purchase a brand I was unfamiliar with and hesitant to purchase a front loading washer primarilly due to mold and mildew concerns. The washer and dryer are far quieter than anything I have seen or heard before. I had read reviews about them being quiet but they were understated. THESE APPLIANCES ARE QUIET!!! Although the washer takes a bit longer for a full cycle than I am used to, it is doing an excellent job cleaning clothes and is doing so with less detergent and water. The dryer is the fastest I have experienced. There is less lint than we have ever seen probably due to a gentler cleaning than ever. Oh, did I mention, the washer and dryer are so QUIET! I love them!!! The only negatives are the cost - a bit pricy but comparable to others in the same class; the access door height - I did not purchase the optional cabinets for under the units which means a bit more bending than I am used to; and the fact that the washer door is not reversible - it opens to the left and that is that. The dryer door is reversible. I would highly recommend this to anyone - based on 6 weeks of experience and a lot of laundry. We purchased the washer and dryer in November. I was skeptical at first because it was so different than my top loader, but now I love it. We have four children and one is an infant, and the stain removal feature is amazing!!!! I had baby clothes with a diaper blowout that sat in the laundry for 3 days, w/o being rinsed (yuk) and threw them in the wash on hot with the stain removal feature...NO Stains!!!! clean clean clean. Uses very little soap and my water bill just went down by 10 a month and my electicity bill went down by 15 dollars. No joke. I love it. Join in and write your own page! It's easy to do. How? Simply click here to return to Bosch Washing Machine Consumer Reports.